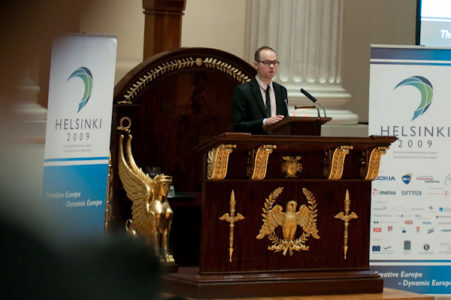 Ville Vasaramäki, a former President of EYP Finland, has started his term as the Executive Director of the international EYP. Ville started his EYP career some ten years ago and has since served in several roles in the organisation, including being the Coordinator of the Board of National Committees and the Chair of the National Organising Committee of Helsinki 2009, the 62nd International Session of the EYP. He succeeds Jan-Philipp Beck who has moved to seek further challenges outside the EYP. The Executive Director is responsible for running the day-to-day operations of the international office in Berlin. The office assists the organising teams of International Sessions, prepares applications for international grants and coordinates various projects on the international level – among other things. The board of EYP Finland wishes Ville the best of luck in his future challenges!